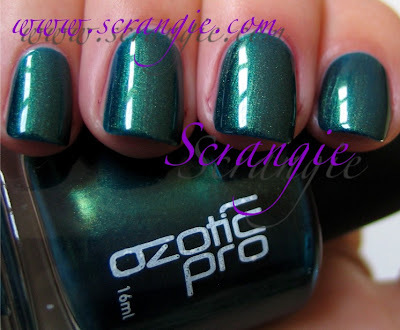 Another one of my favorite Ozotic polishes. It's not one of the crazy rainbow multichromes and it's not holographic, but it's still super pretty. Ozotic Pro 120. 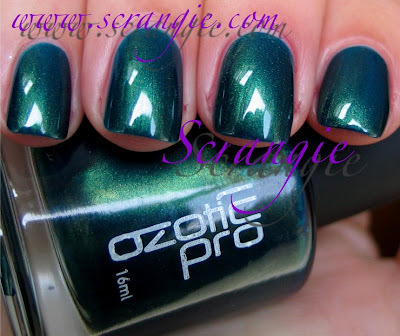 This one's basically just a pure blue/green duochrome. Deep sapphire blue and lighter emerald green. It has a nice jelly quality to it that allows the green shimmer to get sandwiched within the layers of blue base, which gives it more depth than your average shimmer polish. I know there are a few other polishes that look like this one (Bloom Bianca comes to mind), but it's pretty in any incarnation. It's dreamy. Your swatch is love! Oh my gosh, Scrangie - GORGEOUS! But I won't be able to buy any Ozotics anytime soon. Sniff sniff...I've been much better with my beauty purchases so far just because we're getting into the holiday season. oh wow, you make me want this polish BUT....I already have it! Love this, it's so pretty. Do you happen to have Rimmel Mania? I wonder how that shade compares to this one? Gorgeous colour!